A last-second layup basket by Glory Ellison made the difference that gave the Spartans a 59-57 win over the Hawks in the BYU-Idaho Women’s Competitive Intramural Basketball season opener on Jan. 26. With five seconds left on the clock, the Spartans had an inbound pass and the ball ended up in Ellison’s hands. She drove to the basket and put it in with two seconds left on the clock in the fourth quarter. “I honestly didn’t think we’d have time to pass the ball around. So, I just took the ball and got it up, and it went in.” said Ellison. Ellison finished the game with 18 points for the Spartans, with five of those coming off the free throw line. “I had a rough first half, but as I got more into the game I felt more comfortable and confident with our team,” said Ellison. The Hawks continued to battle, as they moved the ball down the court before calling a timeout with one second left, to regroup. After the timeout the ball made its way to Rylee Belnap, who took one last shot from the three-point line that would have won the game, but it bounced off the rim as the buzzer went off. Belnap was a key player for the Hawks as they matched the Spartans basket for basket. With 12 seconds left in the fourth quarter, Belnap drained a 3-pointer from the right side to tie the game 57-57, which set up the possession for the Spartans to seal their win. “Rylee’s a really good player, I wanted her right away because of her ability to score points for us. She’s someone I want on the court for my team every time.” said Hawks coach Hayden Bennett. The Spartans jumped to an early lead in the first quarter as they scored 15 points. Jazmin Romeo helped lead the charge, gaining three assists and several steals. She would end the game, scoring 18 points, with 12 of those coming from 3 pointers. 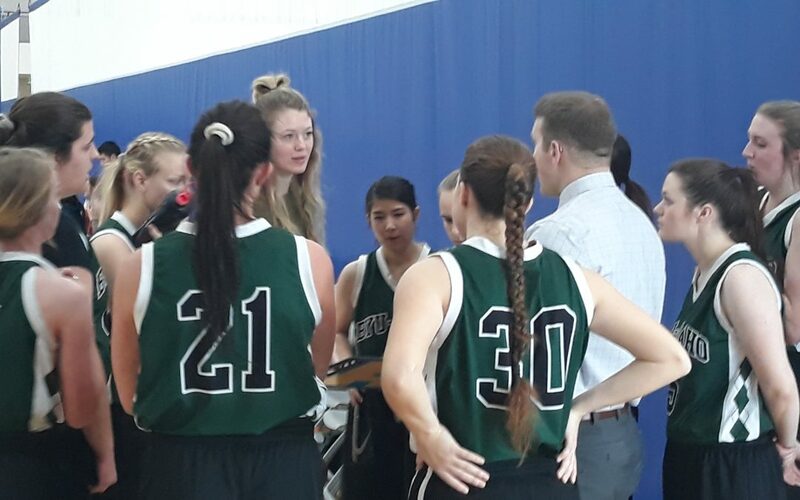 The Hawks answered back in the second quarter by scoring 17 points, led by Maycee Belnap and Hallie Cook, giving their team the lead 28-23 heading into half time. Both teams came out of half time swinging as both battled to take the lead for the rest of the game. Romero and Ellison helped carry the Spartans while the Belnap sisters led the Hawks charge. The Hawks and Spartans will play their second games of the season on Friday, Feb. 1 in the BYU-Idaho Center courts at 7 p.m. and 9 p.m. respectively.